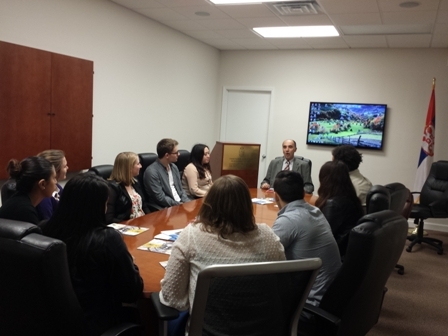 Group of students from the University of Illinois, led by Bridget Hockenberry, program President of the International Business Club, visited the Consulate General. On that occasion there was a presentation about Serbia's political system, foreign policy, bilateral relations with the United States, the culture of the Serbian people and Serbian famous scientists, as well as other affirmative amenities such as customs, diet and success in sports. Considering the special interest for the business climate in Serbia, a simultaneous presentation was given on the economic situation and investment opportunities in Serbia. Through the presentation of "Invest in Serbia" by the Serbia Investment and Export Promotion Agency advantages for foreign investors in terms of tax incentives, competitive tax environment, low operating costs, free trade agreements, educational staff and others were presented.